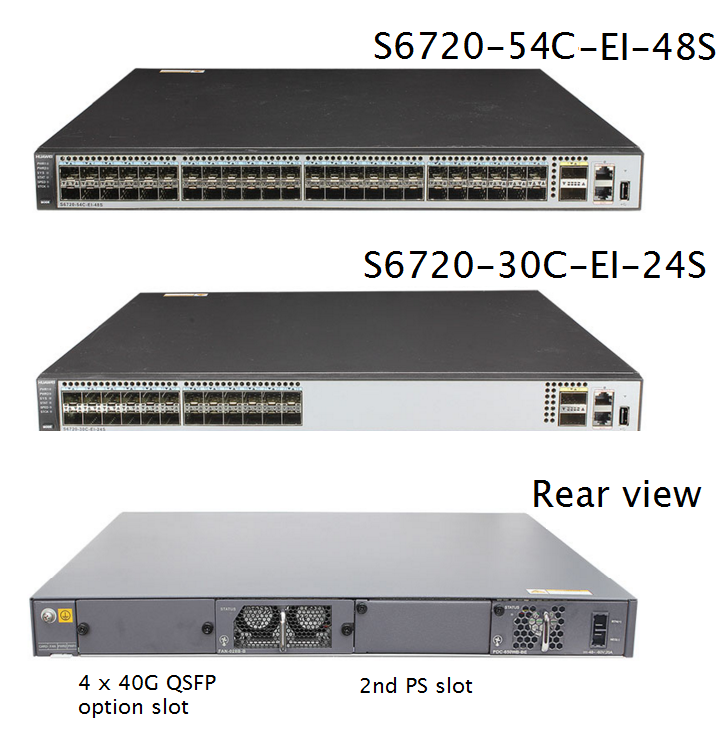 These switches have 24 and 48 10 Gb/s SFP+ ports and QSFP uplinks that match the speeds and feeds of Broadcom's Trident2. The pictures certainly suggest that these are similar to Trident2 products. A careful reading of the specifications suggests that these switches were probably inspired by the Broadcom competitors, but contain Huawei silicon. The data sheets and docs make no mention of either cut-thru switching or VxLAN. And the introduction date measured by the first version date in the documentation is July 2015 which lags behind other Trident2 implementations. This is Huawei's second 10 Gb/s switch. Their first issue was/is the 6700 family. It was introduced in October 2014. These switches do not have the uplink slot on the back and that cuts the max PPS forwarding rate relative to 6720. Huawei's specifications are frustrating. There are no references to RFCs. And specifications for system packet buffers are nowhere to be found. Well, almost nowhere. Huawei commissioned a Tolly review of the product. Curiously, Tolly reports an entirely respectible 8 Mbyte buffer for a single port. Tolly says nothing about how he got the number. And it isn't in Huawei's information. Reviewing Huawei documentation is certainly a special experience. The sum of the contents of of the books that make up the manual set are over 180 Megabytes of PDFs. The Command reference by itself is 33 MB and over 8,800 pages long. Information on buffers in switches from other manufacturers is usually contained in the QoS chapter, or failing that -- in the command reference. Huawei seems to have gone to special pains to describe buffer management without disclosing what is in the box. I lifted the most relevant page from the Command Reference. I suspect that the chip has 12 MB of packet memory and 8 MB is the port limit when the switch operates in extreme mode. Without any information, I suspect that these Huawei switches may well be a price leader among switches in their class.